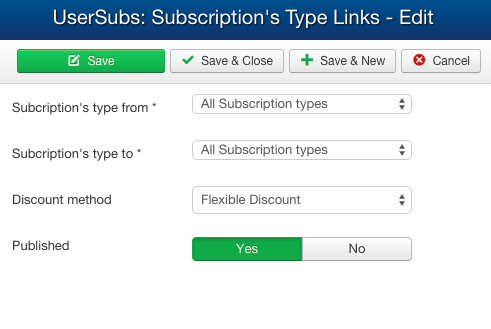 Your subscription types are the different plans you offer. You can create new ones by clicking on the button "new". 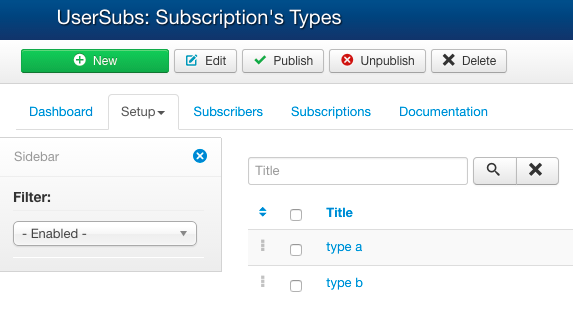 You must create at least one type to begin working with subscriptions. 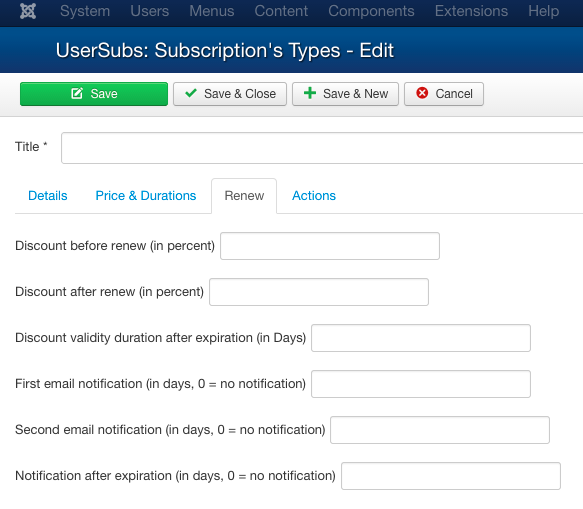 In the actions tab, you will be able to configure what to do when a subscription is activated and expired. 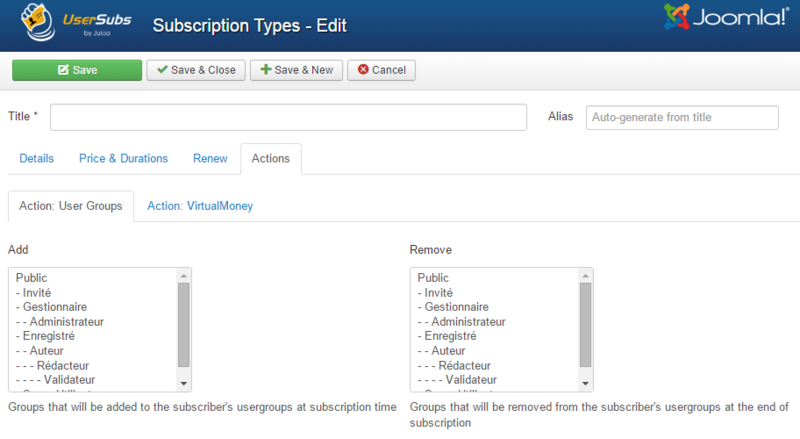 This plugin will add the subscriber in the selected usergroups when the subscription is activated and will remove the subscriber from the selected usergroups when the subscription expires. This plugin will grant bonus credit to the subscriber at the activation of the subscription. You can also specify the price in credit for information, the change must be made in the virtualmoney payment plugin in the Invoicing component. Note: Obviously, the Virtualmoney component is mandatory if you wish to use the virtualmoney plugin. By linking two subscriptions, your users will be able to upgrade their subscription without losing what they paid for the first one. For example, if a user have a silver account that cost 30€ and wish to upgrade to a gold account that cost 60€. The link will check how many time left for the first subscription and will apply a discount to the cost of the new subscription. The discount method "Flexible Discount" will adapt the discount by checking the number of days left to the base subscription. The first subscription will automatically be disabled when the new one will be activated. 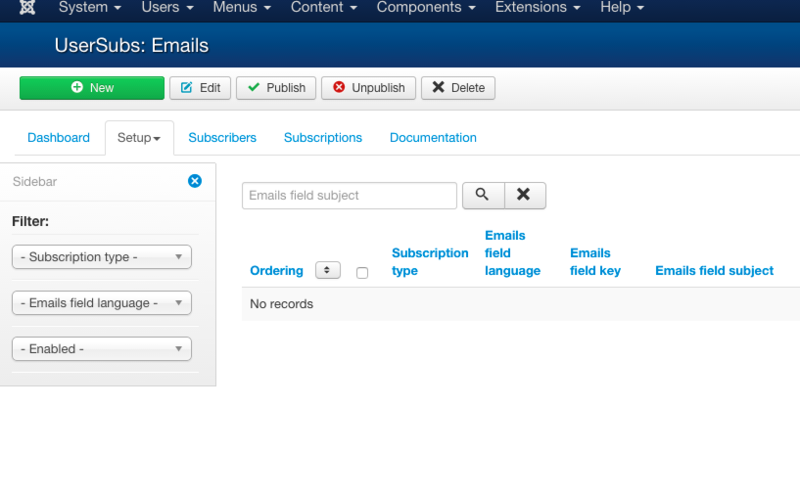 The emails part helps you to customize the way you communicate with your subscribers. You can for example create a mail targetting only the users of a precise subscription plan and being sent a certain number of days after expiration of the subscription. You can also target way more users, the choice is left to you. You have total control on the whole content of the mail to be sent's content via the form on the creation page.